"55 Cancri e" is a girl's best friend. Why not visit 55 Cancri e? It's a mere 40 light years away from Earth, completely orbits its sun in a blisteringly quick 18 hours and its surface temperature can reach a pleasant 3,900 degrees Fahrenheit. Oh, did I mention that scientists believe that at least a third of the planet is made of diamonds? Discovered back in 2011 when it crossed in front of its star, 55 Cancri e is packing some serious booty. It's roughly twice the size of Earth, but estimates put its mass at roughly eight times that of our planet. The mass estimate, when checked against the planet's radius and orbital difference, have allowed a team of astronomers to determine its chemical make up with the aid of computer modeling tools. Their best guess? It's mostly made of bling. Previously, scientists believed the planet contained substantial amounts of super-heated water. "The surface of this planet is likely covered in graphite and diamond rather than water and granite," explained Yale researcher, Nikku Madhusudhan. 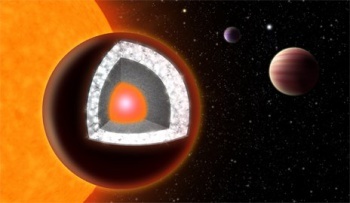 "Science fiction has dreamed of diamond planets for many years, so it's amazing that we finally have evidence of its existence in the real universe. It's the first time we know of such an exotic planet that we think was born mostly of carbon-which really makes this a fundamental game-changer in our understanding of what's possible in planetary chemistry." This isn't the first "diamond planet" astronomers have come across, but it's the first time one has been observed in a solar system similar to our own. The system's sun, 55 Cancri A, is actually visible to the naked eye and can be seen in the constellation of Cancer. According to Madhusudhan, the discovery of the planet's jeweled interior challenges commonly held assumptions about the composition of Earth-like planets.